Each year more and more accidents and deaths occur as a result of poorly stored guns. The sad thing is, these accidents could have been prevented. If you own a gun, locking it up is a step in the right direction. It’s not just a wise choice, it’s the right thing to do. Responsible gun owners should know that it’s just not safe to keep your firearms in a closet, garage cabinet, or under your bed. But unfortunately, some gun owners choose to do just that. If you want to keep your children, thieves and other unaccessed persons from your firearms — and avoid a preventable fatality, you need to purchase a quality-made gun safe. With so many gun safe choices on the market today, your only concern should be which one to choose. And there’s no better time to be a gun owner than right now. For this review, I’d like to help you with your decision and highlight a few gun safes made by the Heritage Safe Company. The Heritage Safe Company is a private and local security company known for their quality customer service and reputable safe brands. For over 20 years, the company concept has always been to design and produce affordable home and gun safes. Headquartered in Idaho, the family-owned company offers top-notch products for home security, pistol security and heavy-duty gun cabinets. By concentrating on the functionality of every safe and making sure it meets user demands and needs, the company is able to be extremely creative in the design of their secure and theft deterrent products. In addition, they will launch new products occasionally. A Heritage safe, as well as any quality-made safe, is designed specifically for preserving and protecting your most valuable items including jewelry, confidential documents, land titles, jewelry, and of course, firearms. If you choose to invest in a Heritage safe for any of the above mentioned reasons, you will not only be purchasing a unit to protect your guns against thieves and unwanted elements, you’ll be securing your loved ones as well. The Heritage Safe Company takes great pride in every safe they design and make, as customer satisfaction is their number one priority. With the customer’s needs first and foremost, it allows the company to truly focus on designs and features that will benefit their loyal consumers. In terms of fire, home and gun protection safety, Heritage makes sure that all products are custom built in alignment with a client’s specific standards. Satisfaction for a lifetime is the company’s main mission. For one thing, the Heritage Safe Company dedicates themselves to public policy and safety and are committed to keeping children out of harm’s way. In addition, they offer a wide range of products made under strict company standards, as well as industry expectations, while also complying with the California Department of Justice (DOJ) policies on safes. The Heritage Safe Company created the Fortress brand over 20 years ago and their concept was to produce a more affordable alternative to their higher-end safes. Since 2011, the different gun safes the company offers has drastically changed. To simplify these facts for the sake of this review, Heritage actually markets its products under two different brand names: Heritage Safe and Fortress Security. Additionally, the Fortress Security product line is less expensive and more value oriented. It’s overall a very budget-friendly product. 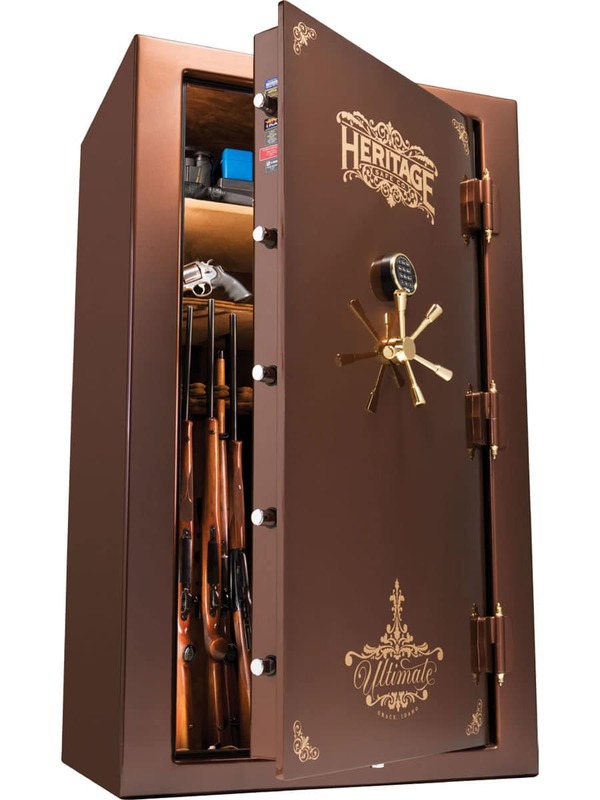 Now that you have some background on the Heritage Safe Company, let’s talk about what kind of gun safes they offer. 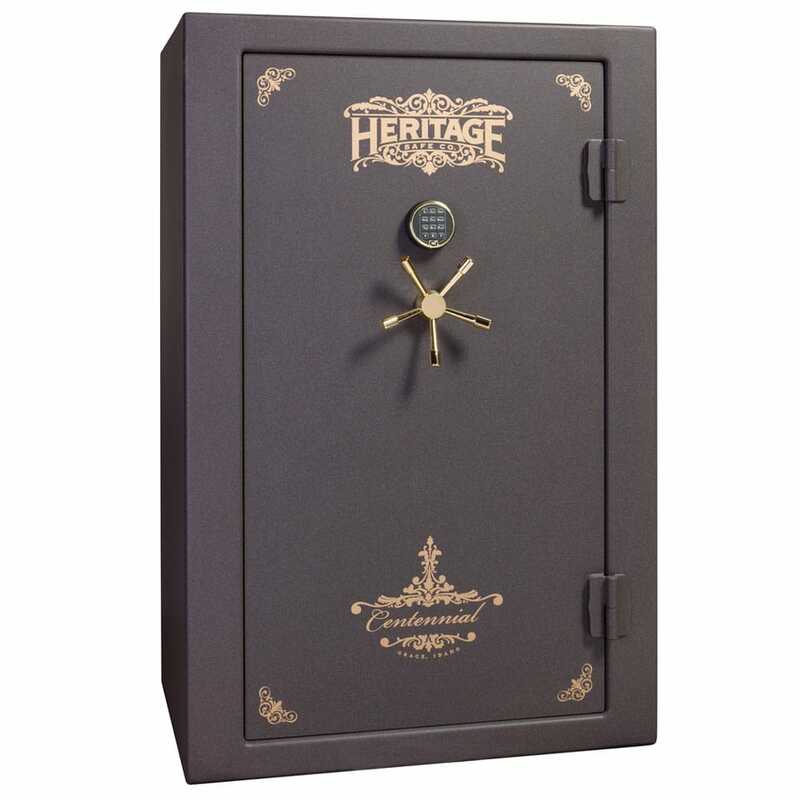 It’s true that lighter safes are relatively easy to open by thieves, so Heritage simply doesn’t offer them. Instead, they keep to their high standards of designing only tough and resilient units, while continuing to stay competitive against popular safe brands such as Liberty. The Heritage Safe Company understands that a gun safe’s door is the primary point of intrusion. Therefore, they offer four times as much steel as the industry standard. The Ultimate Series by Heritage is the cream of the crop. Top of the line quality is what you’ll get with this big gun safe. It’s also one of the company’s best sellers because it’s made with high-quality and tough, resilient materials. If you’re looking for something ridiculously solid and sturdy at a greater weight with thicker steel, improved fire protection and larger bolts, look no further. The Ultimate Series is offered in 30, 48, 56 and 72 gun capacity. Extremely heavy – 1,200 to 2,200 lbs. 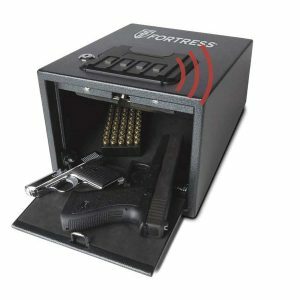 Every gun owner seeks a safe with a complete set of safety and security features. Why else would you be looking for a gun safe, right? With its elegant design and heavy, top-notch mechanics, the Legacy Series is sure to last you for many years to come. Offering the gun owner better fire protection, a glass re-locker system, and more weight, the Legacy Series comes in 30, 48, 56 and 72 gun capacity. It’s simply perfect for your long guns. The Centennial Series is the entry-level model for Heritage Gun Safes and it is a pretty good entry-level model. It’s very heavy and all around good choice. The super security features seem to be much better than other entry-level brands. Again, the Centennial Series comes in 30, 48, 56 and 72 gun capacity. For exceptional safety and security, the Heritage Safe Company continues to improve in bringing innovative designs and quality products to their customers. 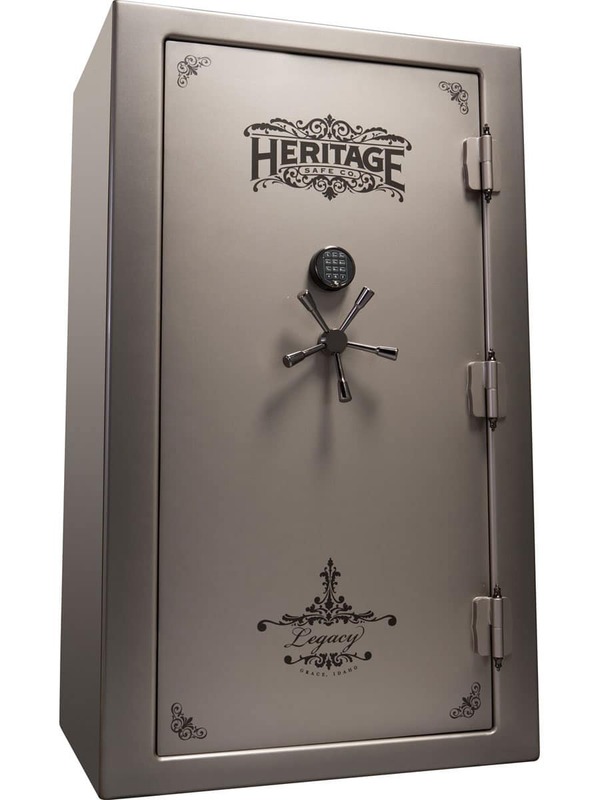 With superior functionality as well as user-friendly, space saving features, a safe made by Heritage is a solid choice. Heritage products are top-of-the-line and highly innovative, all while keeping customer ease and budget in mind. By offering units that come with heavier steel construction, thicker housing and superior locking bolts, you’ll also enjoy an attractive safe interior design. Whether you’re safeguarding pistols or heirlooms, jewelry or keepsakes, the Heritage Safe Company has an affordable model for you. A member of the National Gun Safe Coalition, the company is committed to public safety, public policy that protects children, and legislation that benefits the gun owner. Heritage is definitely a seller worthy of your consideration. With gun security at an all-time high, you owe it to yourself, your family and your society to invest in a gun safe. So for this Christmas, do the right thing — take a look at your options and compare a few gun safe brands online. And if you’re not sure, you can always stop by one of your trusty firearm merchants for a second opinion.